Analee, Rattanapraxa; & Wongthai, Nuntana. (2015). Classifiers in Lao: A cognitive linguistic approach. International Journal of Languages, Literature and Linguistics. 1(1): 45-50. Wongthai, Nuntana. (2013). The Understanding of Synaesthetic Metaphors. Journal of Korean Association of Thai Studies. 20(1): 1-14. Wongthai, Nuntana. (2010). Synaesthetic Metaphors in Thai: A Cognitive Linguistic Study. Journal of Korean Association of Thai Studies. 16(2): 1-27. นันทนา วงษ์ไทย. (2556, มกราคม–มิถุนายน). การวิเคราะห์วาทกรรมความงามในโฆษณาเครื่องดื่มเพื่อความงาม. วารสารมนุษยศาสตร์. 20(1): 77-107. นันทนา วงษ์ไทย. (2555, มกราคม–มิถุนายน). อุปลักษณ์เชิงมโนทัศน์เกี่ยวกับความตายในภาษาไทย. วารสารภาษาและวัฒนธรรม. 31(1): 43-64. นันธิกานต์ จันทร์อภิบาล; และนันทนา วงษ์ไทย. (2554). การใช้คำเรียกขานคู่สนทนาที่ไม่คุ้นเคย. ใน รวมบทความวิจัยสารนิพนธ์ของนิสิตระดับปริญญาโท ตั้งแต่ปี 2553-2555. กรุงเทพฯ: คณะมนุษยศาสตร์ มหาวิทยาลัยศรีนครินทรวิโรฒ. นันทนา วงษ์ไทย. (2553, กรกฎาคม–ธันวาคม). สรรพนามที่ทำหน้าที่ขยาย: กรณีศึกษาเฉพาะบุรุษสรรพนาม. วารสารภาษาและภาษาศาสตร์. 29(1): 43-55. นันทนา วงษ์ไทย. (2552, กรกฎาคม-ธันวาคม). คำอ้างถึงตนเองของผู้หญิงกับคู่สนทนาที่ไม่คุ้นเคย. The Journal. 5(2): 121-136. Buanak, Narin;& Wongthai, Nuntana. (2015). The Conceptual Metaphors of World Cup 2014 News and Thai League Football News. 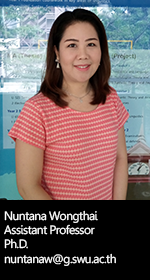 Paper Presented in the 2nd International Conference on Language, Literature, & Cultural Studies at A-One Cruise Hotel, Pattaya, 20-21 August 2015. Sama-ae, Nura-a; & Wongthai, Nuntana. (2015). Cooking Terms in Patani Malay: An Ethnosemantic Study. Paper Presented in the Second International Conference on Language, Innovation, Culture & Education (ICLICE) 2015, Royal Plaza on Scotts Hotel, Singapore, 27-28 November 2015. Singprasert, Chothika; & Wongthai, Nuntana. (2015). Travel Blogs as a Reflection of Thai Perspectives on Myanmar. Paper Presented in the Second International Conference on Language, Innovation, Culture & Education (ICLICE) 2015, Royal Plaza on Scotts Hotel, Singapore, 27-28 November 2015. Wongthai, Nuntana. (2015). The semantic extension of internal body part terms in Thai. Paper presented in the Second Asian Conference on the Arts, Humanities and Sustainability’ at the Clio Court Hotel, Fukuoka, Japan 1-3 November 2015. Wongthai, Nuntana. (2012). A Study of Beauty Discourse in Beauty Drinks Advertisements. Paper presented in the 4th International Conference on Language and Communication 2012 at National Institute of Development Administration, Bangkok, Thailand. Wongthai, Nuntana. (2012). The Conceptual Metaphors of Death in Thai. Paper presented in the Annual International Conference on Language, Literature and Linguistics (L3 2012). Hotel Fort Canning, Singapore, July 9-10. Wongthai, Nuntana. (2011). Pronouns in Apposition in Thai: A Study of Personal Pronoun. Paper presented in Thammasat International Symposium on Language and Linguistics (TISLL), September 23.